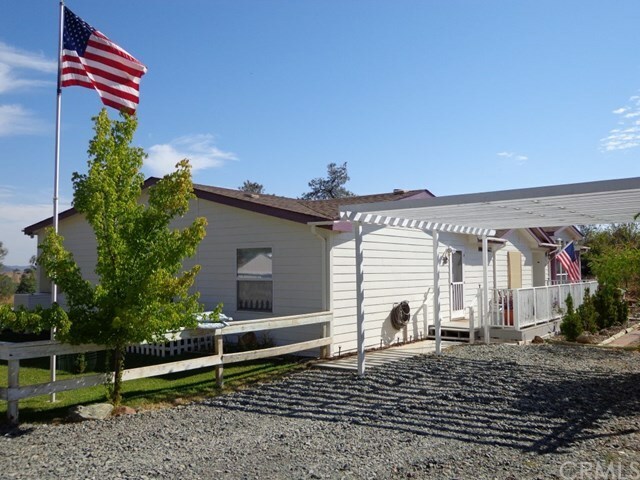 Extremely well kept manufactured home on foundation on 5.11 acres, with the adjacent 5.08 acres included in the sale (APN 010-330-057) for a total of 10.19 acres. This 2,653 square foot home has formal living room and family room, large kitchen with corian counters, walk-in pantry and eating counter, dining area, laundry room and the master suite has a separate room attached which could be used as an office, retreat, exercise room or nursery. Skylights provide exceptional natural light, plus there are solar screens to use on them in the summer. Home has 6" exterior walls and was built for cold climates, which also provides good insulation in the heat of summer. Deck at rear of home has a gazebo and looks over a green lawn and fruit trees with a pond feature along the side. Separately fenced garden area. Detached 2 car garage building with additional storage. The entire 10 plus acres are fenced and cross fenced, and there is a small barn for livestock. Open pasture areas, plus oak trees and some brush, which has wide trails throughout plus some open areas. Domestic well has continued to produce in spite of the extensive drought conditions.